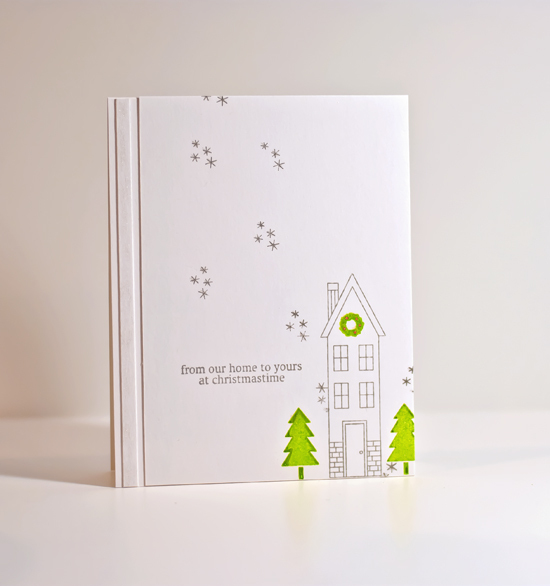 Used Stampin Up's Holiday Home to create a white, gray, and bright green card. The strip of white on the side, the trees, snowflakes, and wreath are painted with Wink of Stella clear brush pen (love that stuff). HUSBAND'S COMMENT = "I like the green." Love the pop of color! So pretty! Love the green too. I also wanted to pop by and say thank you for a couple things. First, the tip you shared about how to you can tag your photos in your blog post so it shows up when you Pin is such a time saver, and for recommending the Absorber. I had a made a mental note of it (which isn't very reliable) but at Walmart the other day happened down the auto parts aisle and remembered to look for it and sure enough they had it. I hemmed and hawed as it was $10 (and I am cheap) but figured a couple packs of baby wipes and I've broken even and Joan did say it worked great. I am very happy to report that I love it and it is heavenly to not have lint all over my cleaned stamp! So thank you very much. I hope you don't mind if I share on my blog as well. Have a great evening! I absolutely love this and the first thing that struck me about it is how great the photo is. It's not easy to get a good photo of white. I don't have a light tent and no room to set one up with the lights, so I make do and it's frustrating at times. This set is so cute. It's funny how your husband's comment was about the green. I know he likes bright colors. I look for a bright lime green whenever I'm out craft shopping, but so far no good. Bravo, Joan! I love all the white with the gray and pop of green. Beautiful card! Love that pop of color on this serene scene. Fabulous. I'm with Mike. I like the green too. Oh, this is just wonderful. That set is on my wish list, and I love the green, too. And, it's a very fun shade of green, too. Fresh and lovely, Joan! I like that little strip down the side as well--an interesting element that doesn't make it thicker. . . Will have to try that! I also like the strip a lot...it's there, but subtle. I like layers/elements in mono white but have not seen that one before. I am always afraid of big open spaces left but you did it in a way it not busy but isnt blank either-cool. Thanks everyone. I had fun making this card and am thinking of trying it in some different color patterns. We'll see. Ahh those trees just jump out at you! I love them!! The pop of green--just perfect! What also makes this card is that you didn't stamp in black. I love it!